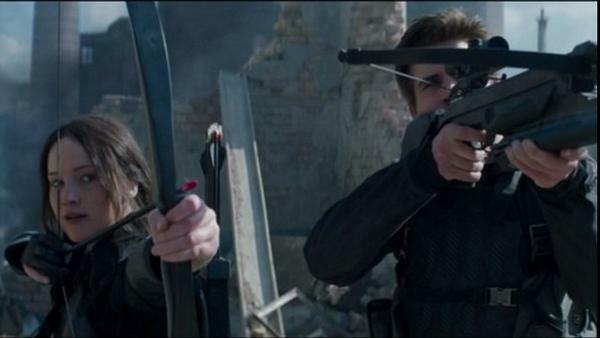 There are still months to go before we get to see Mockingjay Part 1, but at least we can tide ourselves over with a new trailer. According to a video released by The Hunger Games official Instagram, we now know that we'll be treated to a new Mockingjay trailer on Monday, September 15. Throughout the summer, the studio has released a few teaser trailers to give fans something to look forward to, but the fact that Lionsgate has been counting down for five days to the worldwide trailer premiere makes me think it'll be something spectacular. Earlier this week we were treated to a preview of that trailer. In it, Katniss reaches for a white rose while President Snow's voiceover says, "Ms. Everdeen, it’s the things we love the most that destroy us." Then on Sunday we got to see one more snippet of the film in a scene where Gale and Katniss raise their bows to the sky. We don't get to see who they're attacking, but it's safe to assume the war is on in the new trailer. Together they were pretty ominous previews that definitely did their job because I and many other fans can't wait to see the full trailer on Monday. We've seen Katniss, Peeta, Johanna, and even Beetee, but what about the other escaped tribute Finnick Odair? It's only fair that the trailer shows us how he's adjusting to District 13. Or if the trailer wants to be really nice, they can give us a glimpse of his wedding so we can see see him get some joy in his life. Let's face it, we need all the happy Finnick we can get. The news that Effie is in District 13 is a deviation from the book, but not an unwelcome one. I, personally, want to see the two bickering mentors back at it, but with a whole new battle to fight. I want to see what this lost District looks like inside. In the book, we get a pretty good description of the vast concrete tunnel system, but seeing it come to life is always more exciting that just imagining it in your head. We've seen enough of the zombie-like hijacked Peeta. It's time to give fans some hope by seeing him in District 13, at least, and out of the Capitol's hands. Look, even if it has to be a flash of the scene where he attacks her, J. Law and J. Hutch have such good chemistry together that I need to see them together in the trailer to tide me over for the movie. After so much of the promotional material has left Katniss out of things, it's time to bring her out in full force. The trailers can never have enough Katniss. The perfect song for the trailer would be the one Lorde signed up to do, because then we'd get a new trailer and a new Lorde melody all in the same day. Now that's the kind of announcement that deserves a five-day countdown.